MALEVICH Club is a private (not public) club for creative and fun persons. We provide cosiness, comfort and safety. Due to our location (far into the courtyard of the Moscow avenue), you can get to us, just knowing that the club is here. We do not have random guests. Steel entrance door is equipped with video intercom. We have common entry conditions for boys and girls at public events. 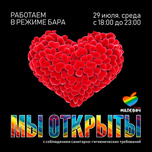 Main objective of the MALEVICH Club - the union of creative people of the LGBT community who wish to share with others their thoughts, feelings, art, hobbies, ideas, technologies of their realization. Previously, these people had no place to meet and communicate, and we decided that it is necessary to combine them into a single space, to give opportunity to showcase the talent his followers. We are steadfast in our intentions and are optimistic about the future. We have and will be uniform conditions for boys and girls. Creative self-realization of people of the LGBT community - one of the main goals in our work. We operate in a cafe mode every day except Mondays, Tuesdays and Wednesdays, from 18-00 to 23-00, at this time are: concerts, presentations, literature and creative evenings, movies, games, performances, photo sessions and interesting meetings. Watch for announcements. Working in a nightclub mode: Thursdays, Fridays, Saturdays and Sundays from 23-00 to 06-00, it's time for thematic parties, birthday parties, shows, dances and dating. 1. On the cards of Malevich Club - 200 rub. 2. For guests who supported the party dress code, as well as those who are dressed in the style of Freak / Transvestite / Masquerade / Fetish - free entrance. 3. For Birthday Hero the entrance is free and and 5 friends - 100 rub. for each person. 4. For guests who do not fall in these categories - the entrance is 300 rub. 5. From 22:00 to 23:00 and after 3:00 the entrance is free for all. The guests of St. Petersburg, which go to the city on the ships, have the opportunity to stay in the city without a visa for 72 hours.